Ecosystems regenerate after a disturbance such as fire, forming mosaics of different age groups structured across a landscape. Pictured are different seral stages in forested ecosystems starting from pioneers colonizing a disturbed site and maturing in successional stages leading to old-growth forests. The scope of ecology covers a wide array of interacting levels of organization spanning micro-level (e.g., cells) to planetary scale (e.g., ecosphere) phenomena. Ecosystems, for example, contain populations of individuals that aggregate into distinct ecological communities. It can take thousands of years for ecological processes to mature through and until the final successional stages of a forest. The area of an ecosystem can vary greatly from tiny to vast. A single tree is of little consequence to the classification of a forest ecosystem, but critically relevant to the smaller organisms living in and on it. Several generations of an aphid population can exist over the lifespan of a single leaf. Each of those aphids, in turn, support diverse bacterial communities. The nature of connections in ecological communities cannot be explained by knowing the details of each species in isolation, because the emergent pattern is neither revealed nor predicted until the ecosystem is studied as an integrated whole. Some ecological principles, however, do exhibit collective properties where the sum of the components explain the properties of the whole, such as birth rates of a population being equal to the sum of individual births over a designated time frame. The scale of ecological dynamics can operate like a closed island with respect to local site variables, such as aphids migrating on a tree, while at the same time remain open with regard to broader scale influences, such as atmosphere or climate. Hence, ecologists have devised means of hierarchically classifying ecosystems by analyzing data collected from finer scale units, such as vegetation associations, climate, and soil types, and integrate this information to identify larger emergent patterns of uniform organization and processes that operate on local to regional, landscape, and chronological scales. Biodiversity (an abbreviation of biological diversity) describes the diversity of life from genes to ecosystems and spans every level of biological organization. Biodiversity means different things to different people and there are many ways to index, measure, characterize, and represent its complex organization. Biodiversity includes species diversity, ecosystem diversity, genetic diversity and the complex processes operating at and among these respective levels. Biodiversity plays an important role in ecological health as much as it does for human health. Preventing or prioritizing species extinctions is one way to preserve biodiversity, but populations, the genetic diversity within them and ecological processes, such as migration, are being threatened on global scales and disappearing rapidly as well. Conservation priorities and management techniques require different approaches and considerations to address the full ecological scope of biodiversity. Populations and species migration, for example, are more sensitive indicators of ecosystem services that sustain and contribute natural capital toward the well-being of humanity. An understanding of biodiversity has practical application for ecosystem-based conservation planners as they make ecologically responsible decisions in management recommendations to consultant firms, governments and industry. The habitat of a species describes the environment over which a species is known to occur and the type of community that is formed as a result. More specifically, "habitats can be defined as regions in environmental space that are composed of multiple dimensions, each representing a biotic or abiotic environmental variable; that is, any component or characteristic of the environment related directly (e.g. forage biomass and quality) or indirectly (e.g. elevation) to the use of a location by the animal. ":745 For example, the habitat might refer to an aquatic or terrestrial environment that can be further categorized as montane or alpine ecosystems. Habitat shifts provide important evidence of competition in nature where one population changes relative to the habitats that most other individuals of the species occupy. One population of a species of tropical lizards (Tropidurus hispidus), for example, has a flattened body relative to the main populations that live in open savanna. The population that lives in an isolated rock outcrop hides in crevasses where its flattened body may improve its performance. Habitat shifts also occur in the developmental life history of amphibians and many insects that transition from aquatic to terrestrial habitats. Biotope and habitat are sometimes used interchangeably, but the former applies to a communities environment, whereas the latter applies to a species' environment. Biogeographical patterns and range distributions are explained or predicted through knowledge and understanding of a species traits and niche requirements. Species have functional traits that are uniquely adapted to the ecological niche. A trait is a measurable property, phenotype, or characteristic of an organism that influences its performance. Genes play an important role in the development and expression of traits. Resident species evolve traits that are fitted to their local environment. This tends to afford them a competitive advantage and discourages similarly adapted species from having an overlapping geographic range. The competitive exclusion principle suggests that two species cannot coexist indefinitely by living off the same limiting resource. When similarly adapted species are found to overlap geographically, closer inspection reveals subtle ecological differences in their habitat or dietary requirements. Some models and empirical studies, however, suggest that disturbances can stabilize the coevolution and shared niche occupancy of similar species inhabiting species rich communities. The habitat plus the niche is called the ecotope, which is defined as the full range of environmental and biological variables affecting an entire species. The ecosystem engineering concept has stimulated a new appreciation for the degree of influence that organisms have on the ecosystem and evolutionary process. The terms niche construction are more often used in reference to the under appreciated feedback mechanism of natural selection imparting forces on the abiotic niche. An example of natural selection through ecosystem engineering occurs in the nests of social insects, including ants, bees, wasps, and termites. There is an emergent homeostasis or homeorhesis in the structure of the nest that regulates, maintains and defends the physiology of the entire colony. 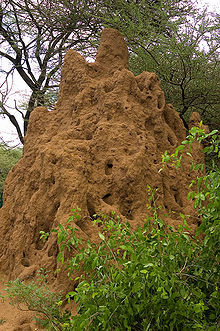 Termite mounds, for example, maintain a constant internal temperature through the design of air-conditioning chimneys. The structure of the nests themselves are subject to the forces of natural selection. Moreover, the nest can survive over successive generations, which means that ancestors inherit both genetic material and a legacy niche that was constructed before their time. Biomes are larger units of organization that categorize regions of the Earth's ecosystems mainly according to the structure and composition of vegetation. Different researchers have applied different methods to define continental boundaries of biomes dominated by different functional types of vegetative communities that are limited in distribution by climate, precipitation, weather and other environmental variables. Examples of biome names include: tropical rainforest, temperate broadleaf and mixed forests, temperate deciduous forest, taiga, tundra, hot desert, and polar desert. 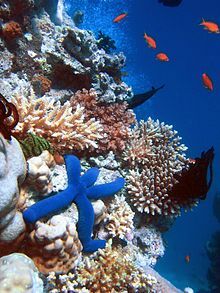 Other researchers have recently started to categorize other types of biomes, such as the human and oceanic microbiomes. To a microbe, the human body is a habitat and a landscape. The microbiome has been largely discovered through advances in molecular genetics that have revealed a hidden richness of microbial diversity on the planet. The oceanic microbiome plays a significant role in the ecological biogeochemistry of the planet's oceans. Ecological theory has been used to explain self-emergent regulatory phenomena at the planetary scale. The largest scale of ecological organization is the biosphere: the total sum of ecosystems on the planet. Ecological relationships regulate the flux of energy, nutrients, and climate all the way up to the planetary scale. For example, the dynamic history of the planetary CO2 and O2 composition of the atmosphere has been largely determined by the biogenic flux of gases coming from respiration and photosynthesis, with levels fluctuating over time and in relation to the ecology and evolution of plants and animals. When sub-component parts are organized into a whole there are oftentimes emergent properties that describe the nature of the system. The Gaia hypothesis is an example of holism applied in ecological theory. The ecology of the planet acts as a single regulatory or holistic unit called Gaia. The Gaia hypothesis states that there is an emergent feedback loop generated by the metabolism of living organisms that maintains the temperature of the Earth and atmospheric conditions within a narrow self-regulating range of tolerance.